UPDATE: Today it was announced that the EU’s plan to re-work data roaming charges on the continent were SCRAPPED! Ironically I had written this post 4 weeks before with all the guidelines and tips that we could look forward to. I’ve just had to re-write it all – but interesting timing! Still – here are my top tips to keeping your data roaming charges as low as possible! Just a quick disclaimer! I mention a few companies below – none of them am I affiliated with in anyway, they are just honest recommendations from my experience travelling abroad. This really should be common knowledge. Importantly however, be sure to turn off your mobile data prior to getting on the plane and leaving the UK (or do it whilst still in flight mode). Otherwise, you’ll get off the plane and instantly download all your emails and notifications and be charged for the privilege! It seems perhaps the most obvious answer, but if its free – use it! Many hotels may offer free wifi in their lobby area, charging only once you require it in your room. Sometimes this is enough for your daily social media top up. If outside of the EU then the wifi cost at your hotel could be significantly lower than your data roaming charges – especially if it is a 24 hour rate as opposed to a download price. Do the maths! 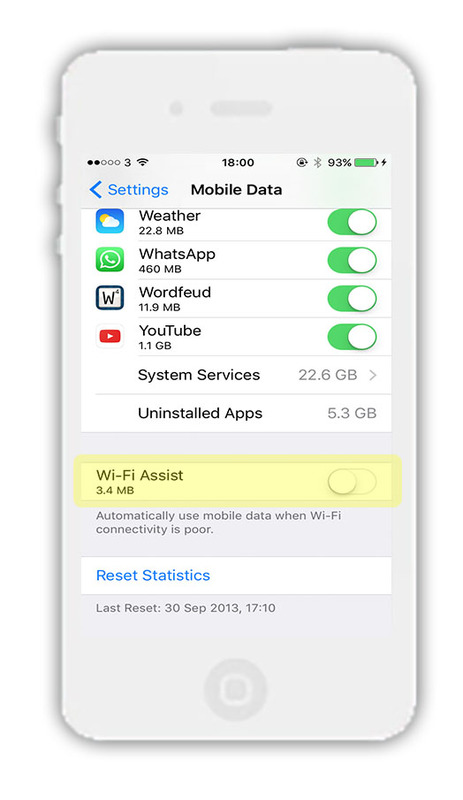 WARNING: In a recent update by apple they included a handy little function called Wi-fi assist. In short this means that if the wifi you are connected to is a tad slow (perhaps you are in the depths of the Amazonian rain forest, or tiger spotting in India), then it will automatically connect you to your network provide and substitute your wifi for data roaming! Obviously this won’t happen if you have data roaming turned off – but be aware. Turn it off in settings > mobile data (you will need to scroll right down to the bottom). When abroad the most likely reason for me needing to use data would be for navigation. I have two brilliant recommendations for this discovered on two recent trips. Google maps without using data: Firstly, did you know that you can use google maps even with your mobile data switched off? You will need to have your network connected, but you shouldn’t be charged for anything provided you don’t take any calls. Whilst in the hotel , download the maps from google that you will need. You can do this just by viewing the area in which you need to travel. Zoom in a few times for the closer versions to be download. Be sure you’ve looked at all the areas of the map you will need. Now, if you turn off your wifi these maps will be remembered in your cache. Your location is found by triangulation from your network, so the blue location dot should show – over the map you previous downloaded! A lot of the carriers will now allow you to cap your daily or monthly spend, or at the very least, alert you to what you are spending. Make sure all of these options are turned on. They may also offer a ‘bundle’ – pre-purchased data or a set spend which should come at a lower rate than paying as you go (paying as you go abroad even if on contract). If you know you will need it, buy the bundle! Mobile data is constantly being used by your apps – from that news alert by BBC, to push notifications by facebook and twitter. Some of these are very small and don’t use a huge amount of data, however things like automatically downloading your emails can hurt. In the settings > mobile data area of your phone you can turn these off and on as you wish. This could be a good idea, for example, if you did want to use your mobile data for google maps whilst out and about, but didn’t want your buddle being sapped by other apps. Turn off the ones you don’t need whilst out and about and pop them back on when you are back on wifi. Turning off email pushing: I’ve found that emails can be a bit of a killer when it comes to eating up data. Large attachments from families and friends keeping you updated, or spam emails coming through – all chip in to that expensive data. I use an iphone, so I’m not sure about other devices, but you should be able to turn this off. Most phones are set to ‘pull’ your emails (check for) every so many minutes. Mine, during the day, is set to every 30 minutes. This is why your phone will beep / vibrant / flash / whatever when you get an email. The email is likely to have not been sent that second, but will have just been retired (every get 5 emails at once?) . To edit these settings on an iphone go to settings > Mail, Contacts, Calendars . Fetch New Data – you can then choose how these are fetched. I usually pick manually so provided I don’t click on the mail icon – emails won’t be downloaded. Change your carrier or get a Sim! Whilst things have changed in the EU, outside of the EU all mobile phone providers charge different amounts. Shop around next time your contact is up if you know you have a lot of foreign travel coming up! Many advise sites also suggests getting a sim card. I personally don’t agree with that advice, as it is only usual for messaging within the country you are in – most people want to message their friends or use data roaming abroad. My final piece of advice is to have a look into three.co.uk. Outside of travel company recommendations I hate promoting companies and services however, Three Mobile is the only company who provide a really great abroad option. I’ve been with them about 7 years now and have used my phone in the USA, Australia and Sri Lanka – without suffering from charges. Their home from home package allows you to travel as if on your existing contract – using data and calling as you wish. I’m going to stop now as I just feeling like I’m banging on making them even more money – but check them out. (I pay £31 per month I think – but I’ll be renegotiating next time! ).